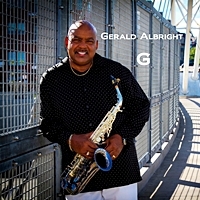 ‘G’ sees Gerald Albright in fine form. Michael McDonald adds his distinctive voice to a cover of Bill Withers ‘Lovely Day’. Check too the mellow ‘I Miss You’. There are plenty of smooth grooves like ‘Boom Boom’ and the jazzy ‘Taking Control’. Try too the slower ‘Frankie B’ and the grittier ‘Funkism’. The tempo ups for the Jazz Funk of ‘We Came To Play’. A strong Gerald Albright set.